The Sharp R642BKW provides a 20 litre capacity, 800w of power and a 1000w grill and is finished in black. Well constructed, works efficiently, quite powerful and offers good value. The controls use symbols instead of text, and so can be a touch confusing at first. Sharp's R642BKW is reasonably priced at around the £100 mark, and provides a fairly standard specification of a 20 litre capacity, 800w of power in microwave mode, and 1000w when using the built in grill. The exterior is a fairly nondescript black, which although doesn't come across as flashy, looks smart and functional. We've already tested this model once before, albeit in the white colour scheme - this is the version for those who prefer darker kitchen appliances. 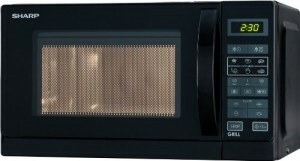 As mentioned before, the control system on the right hand side of the microwave largely consists of symbols, and as such initially it can be a bit tricky to work out which button operates which function - however in the long terms it wouldn't present a problem. Build quality is quite good, as you'd expect from Sharp, and 8 cooking and defrosting programmes are included. The digital timer goes up to a maximum of 99 minutes, with a pretty clear and legible display built in. No complaints there. 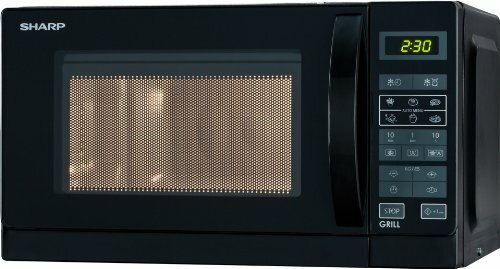 Essentially this is a functional and reliable grill microwave, which is pretty reasonably priced - in our opinion you can't go to far wrong in considering purchasing this black microwave. The Sharp R642BKW provides good value, has decent build quality and works pretty well. 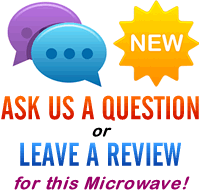 Overall our testers liked this model, and would recommend it to any users looking to buy a medium sized grill microwave.